For Alessandra, dance has been her life long passion and joy. When she was introduced to belly dance in 2008 she fell in love instantly. Her journey through this ancient, magical, and sensual art form has continued ever since. Alessandra performs regularly as a solo artist throughout the Seattle area, including being one of the house dancers at Cliffhanger Sports Bar & Restaurant in Lynnwood, Spiro's Greek Island in Kent, Kasbah Restaurant in Seattle, and Petra Mediterranean Bistro in Seattle. She is a member of the company Lunaria Dance Theatre, which performs cabaret and fusion style belly dance. She was also previously a member of Karavans performing Middle Eastern folkloric dance and Khan Il Khalili performing belly dance fusion. Alessandra won the title of First Runner-Up in the 2010 Emerald Rain Belly Dance Competition - Alternative category. Alessandra has been a GoddessLife Certified Belly Dance Workout Instructor since 2010. She is also a certified teacher through Tamalyn Dallal's Teacher Training in Interpretive Middle Eastern Dance since 2012. Additionally, since 2015, she is Journey Through Egypt Level 1 certified. Alessandra was recognized was one of the Best Dance Teachers in Seattle in 2017. She previously taught classes through the University of Washington's Experimental College from 2013 to 2015. She also previously taught classes at the Ballard, Mill Creek, and Everett LA Fitness locations between 2010 and 2012, and at Fresh Fitness and Dance in Wallingford from 2011 to 2012. Currently, Alessandra only offers private dance instruction. Alessandra has studied with many internationally renowned belly dancers, at times even traveling internationally for training. Her teachers have included Tamalyn Dallal, Mahmoud Reda, Aziza, Princess Farhana, Sadie, Dolphina, Mercedes Nieto, Ruby Beh, Sahra Saeeda, Helena Vlahos, Shahrzad, Jayna Manoushe, Nadira, Alla Kushnir, Nourhan Sharif, and Bozenka. Adding to her fitness experience and credentials, Alessandra previously taught aerobics through the City of Seattle Parks and Recreation. She has also studied jazz and ballet, and she is an avid fitness enthusiast. Rounding out her development as a dancer, are Alessandra's 20+ years as a violinist, which contribute to her understanding of musical phrasing, rhythms, and interpretation. When Alessandra isn't dancing, she loves to travel the world, write, compete in triathlons and half-marathons, volunteer, scuba dive, drink wine, scrapbook, and curl up with a good book. 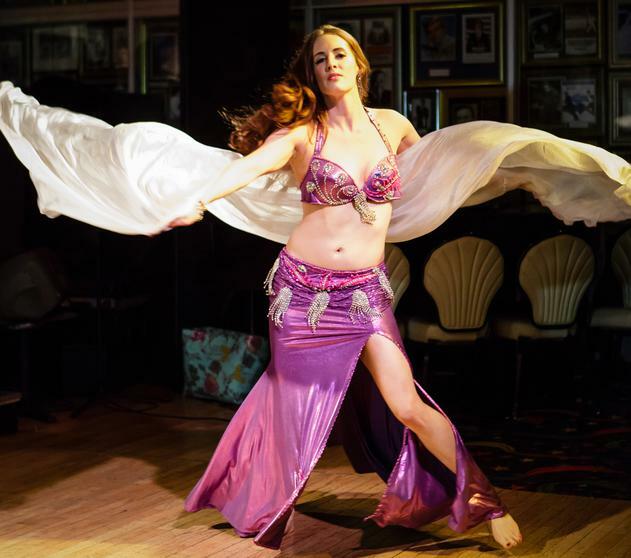 To learn more about Alessandra, you can look at pictures from her wedding day, peruse her bucket list, or read about why she loves belly dance so much.